Nuestra Señora de La Paz: Our Lady of Peace. What a lovely name for a city. 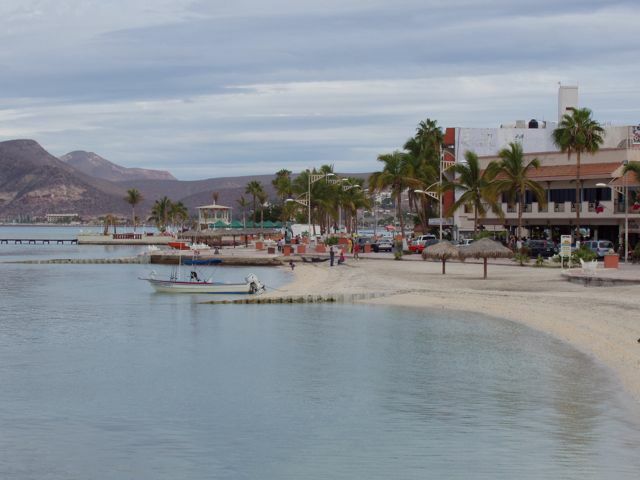 La Paz is the economic, historic, business, and administrative center of the state of Baja California Sur: its capital. It was founded by Spanish conquistadores and their retinue of Catholic missionaries. As usual, the locals were subdued and eventually destroyed, but the city and area become widely settled by many people from other places because of the "oro y plata", the gold and silver that was mined here. 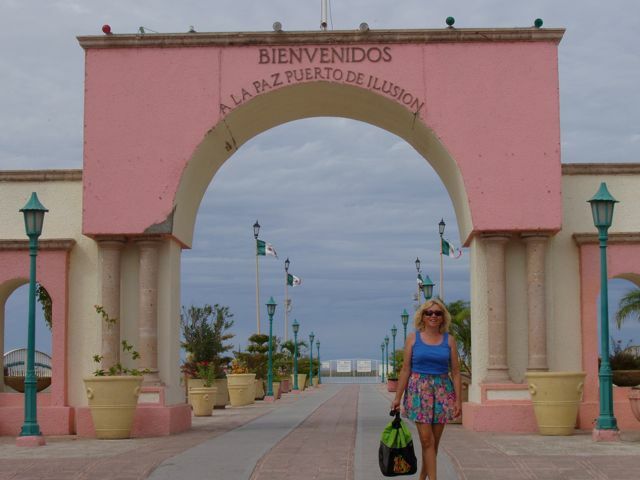 Today, it is a laid-back city with the Sea of Cortez on one side and desert on the other: a city of contrasts. It has also become a haven for retired US residents and cruisers from all nations. With its lovely beaches, many activities, and great weather, it's easy to understand the appeal. 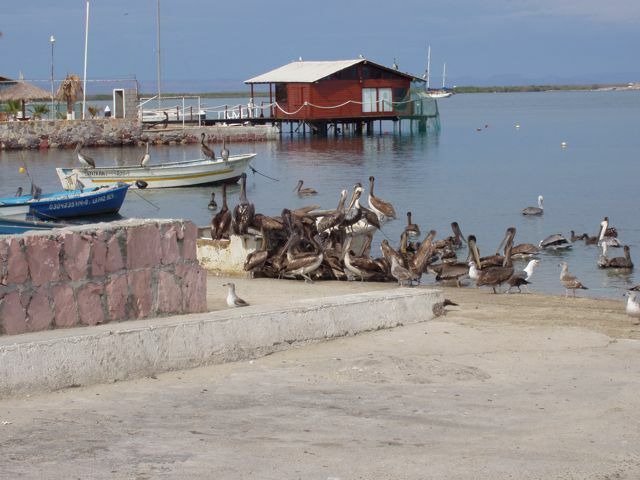 A "gut truck" for pelicans: the cast-offs from the local fishers' cooperative allows these odd birds to make a spectacle of themselves. Watching a pelican with a pouch filled with more fish than it could swallow was a comic sight. Here in the shade, members of the local fishers' cooperative sell their catch. The fishing industry is powerful and has stymied the Mexican government's efforts to manage the Sea of Cortez' fishing fleets, even though the Sea of Cortez has been named a UNESCO World Heritage Site because it's the most diverse fishery in the world. 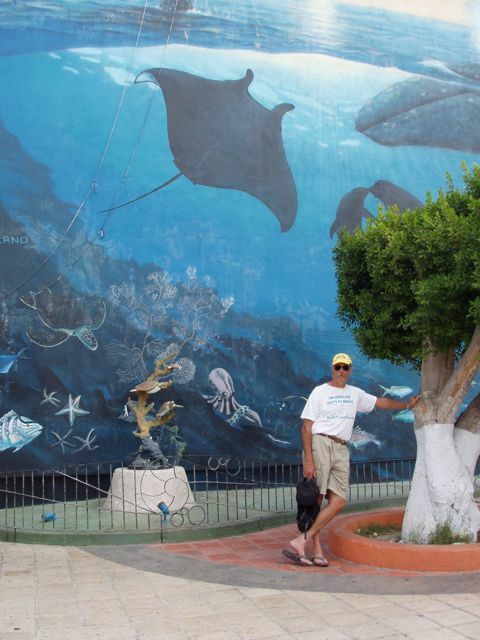 A Wyland mural with a derelict posing in front. The species in the mural are in life-size and color. Note the yellow Baja-Haha hat on the species of bottom feeder leaning against the tree. Lovely Conni poses in front of the Virtual Marina. 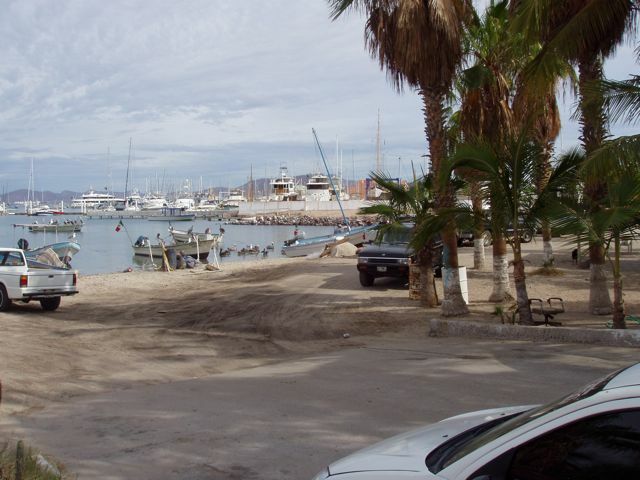 Several years ago, La Paz built a new marina, but it was destroyed by a hurricane and not rebuilt: thus a "virtual" marina. 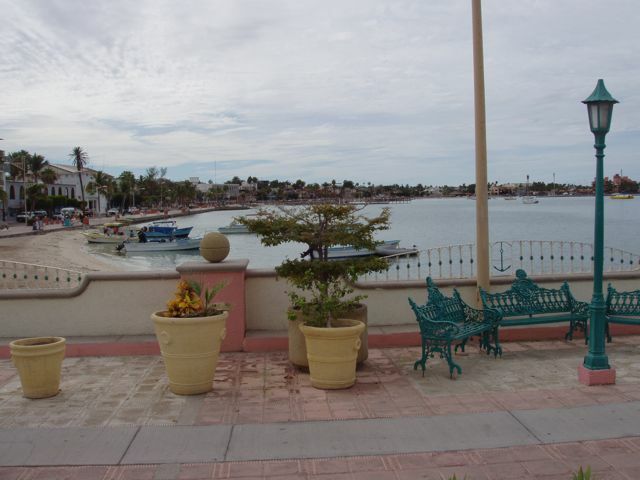 View along the Malecon, or boardwalk, from the virtual marina pier. A nice view of the pier itself, with its lovely wrought-iron work. View toward town, showing the would-be tower of the marina. 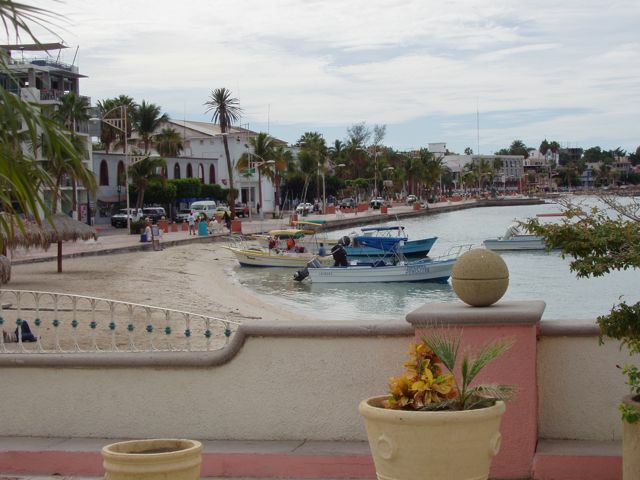 A view down the Malecon. There is little surf here but a sizable tide. The water route into town is a tortuous trip down a dredged channel that is usually 10-15 feet deep. As we entered our marina, we went aground even though we were in the channel. We reacted quickly and damaged only our composure. 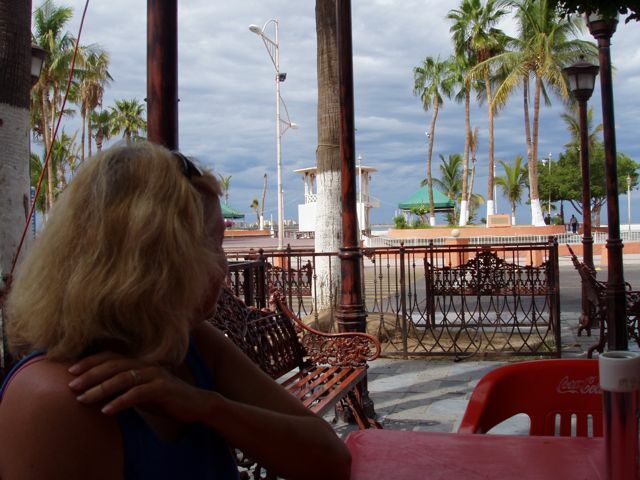 We stopped for ice cream across from the Malecon. Hongo de Balandra is modeled in La Paz's central plaza, center right. Just across the street is the old cathedral. In brief: Hernan Cortez, recently from his conquest of the Aztecs, sends three ships to explore this area. They disappear without a trace. 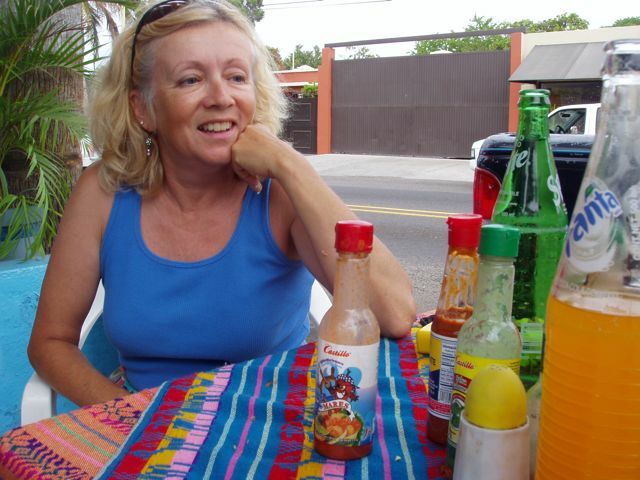 He sends three more and they find Baja California. 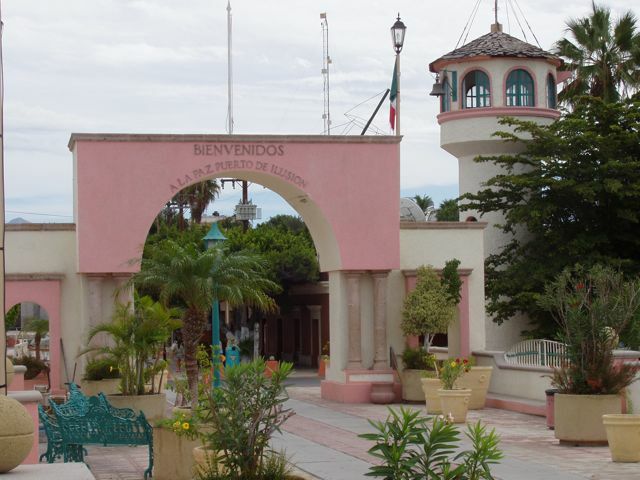 Cortez himself founds a town here that he names "Puerto de Santa Cruz" on May 3, 1535 but it does not survive. 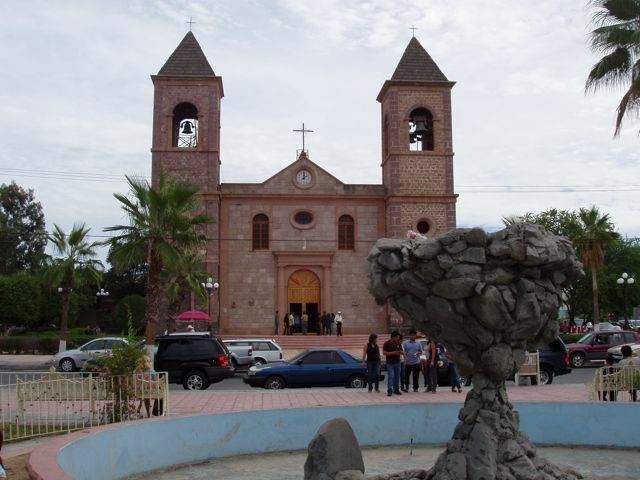 A Jesuit, Father Eusibio Kino, founds another town and names it Our Lady of Peace, "Nuestra Señora de La Paz" but it is soon abandoned. 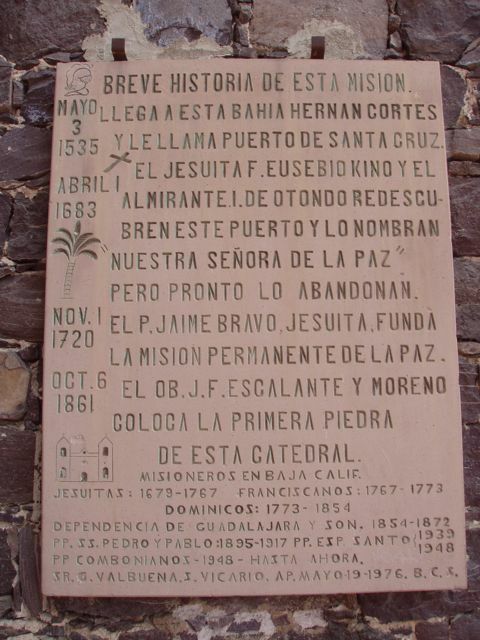 Another Jesuit founds a permanent La Paz on Nov. 1, 1720. 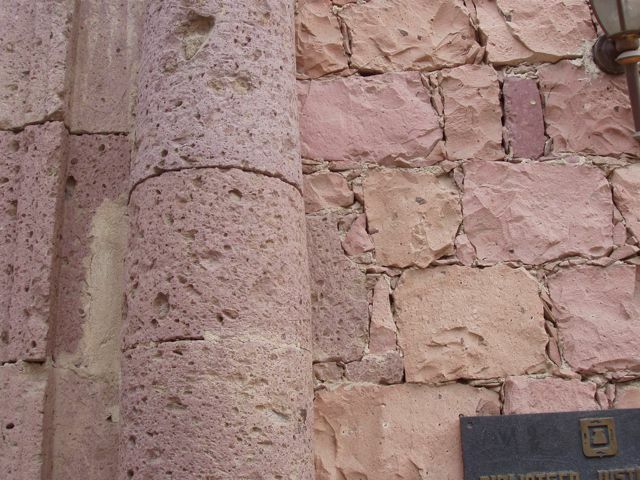 On October 6, 1861, the first rock for this cathedral was placed. Our sister-in-law, Liz, owns a snow cone store! Who knew? Well, maybe not. We've never seen stone work like this. It's very soft stone, with mortar, but pointed with small rocks. The column is so soft that it is honeycombed with small holes. 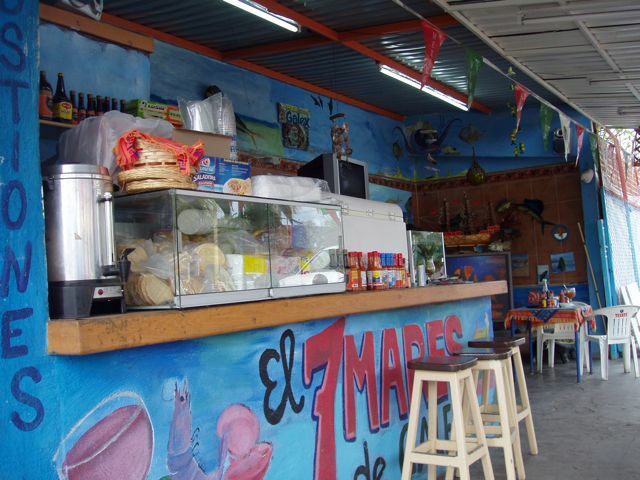 We had lunch at Siete Mares de Galix, or the Galix' Seven Seas. 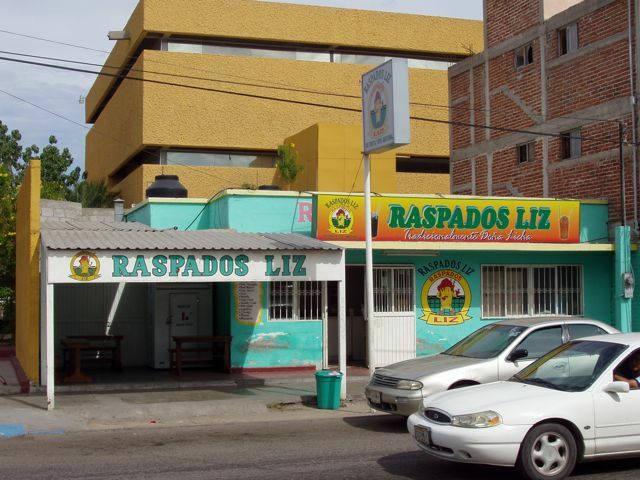 It's a small family-owned restaurant with its tables on the sidewalk. They served no alcohol but we sucked down a few sodas in the heat. We each got two fresh shrimp tacos with all the trimmings, three sodas, and all for $7US. Not bad. The very colorful and open air front of Galix' Seven Seas.